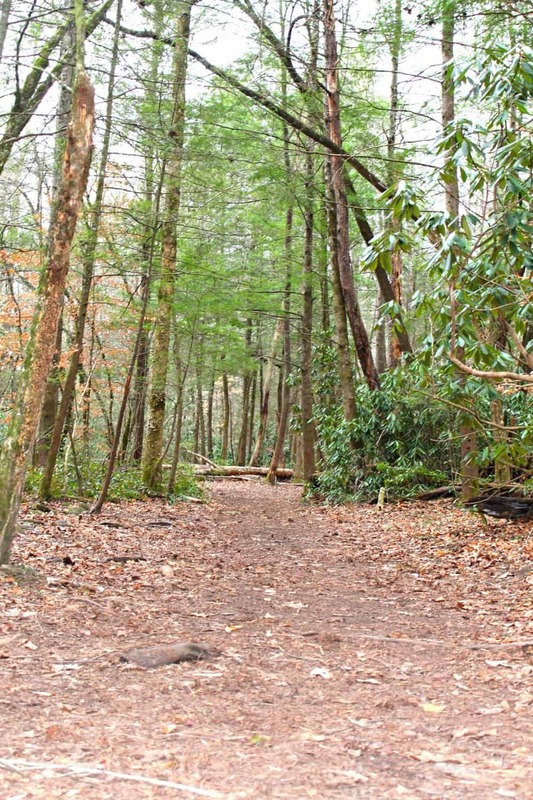 This wooded nature trail in the Smoky Mountains is the perfect short hike for families. Located just behind the Sugarland‘s Visitor Center, this trail is convenient, scenic, and offers an educational twist. This trail is located just behind Sugarland’s Visitor Center, just past the restrooms. I highly recommend stopping at the visitors center either before or after your hike, because it will only add to the fun. In addition to maps and information, the center features a Great Smoky Mountain National Park history video, and a local-wildlife museum featuring taxidermied animals. The center also has restrooms and a gift shop. 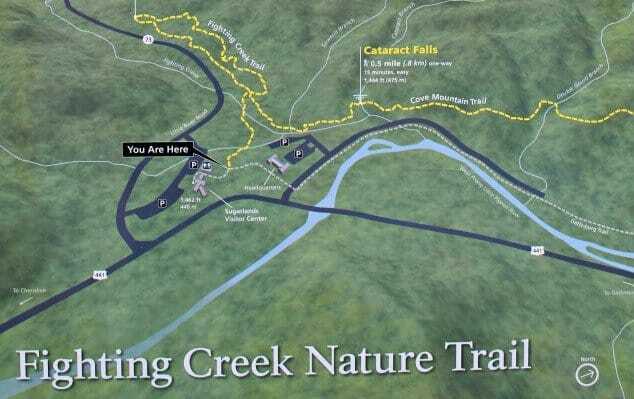 The entrance to Fighting Creek Nature Trail is clearly marked and begins on a fairly level surface without much incline. This being said, I still recommend wearing appropriate hiking boots. Sandals or flipflops are not appropriate for this trail. This is a great trail for educational purposes, because it features informational plaques all along the route. 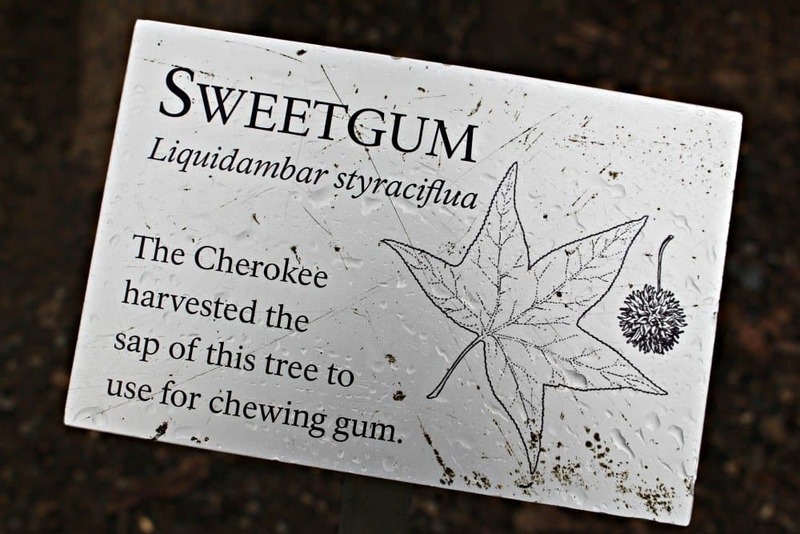 The plaques provide information about the surrounding flora and fauna to help kids learn more about the ecosystem of the Smoky Mountains. There are maps you can purchase at the beginning of the trail. As you can see above, this trail is a complete loop, so there is no need to backtrack on this hike. As you can see, it rained a little during our hike. We always try to keep these compact ponchos in our hiking bag, just in case. 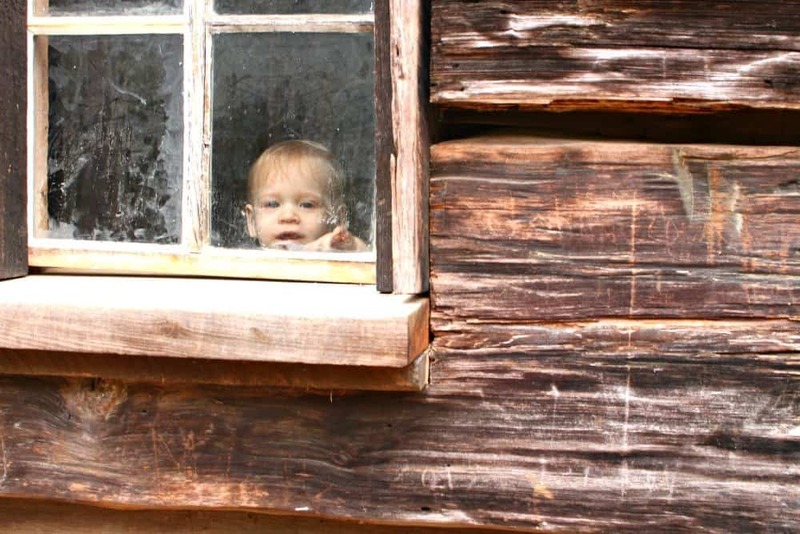 Thankfully, it stopped raining pretty quickly so we could enjoy investigating the historic cabin located along the route. You are a free to walk through and photograph, which is awesome! Although the trail starts out relatively easy, there are some parts that do have a steeper incline. There are also a few sections with a fairly large drop off to one side. 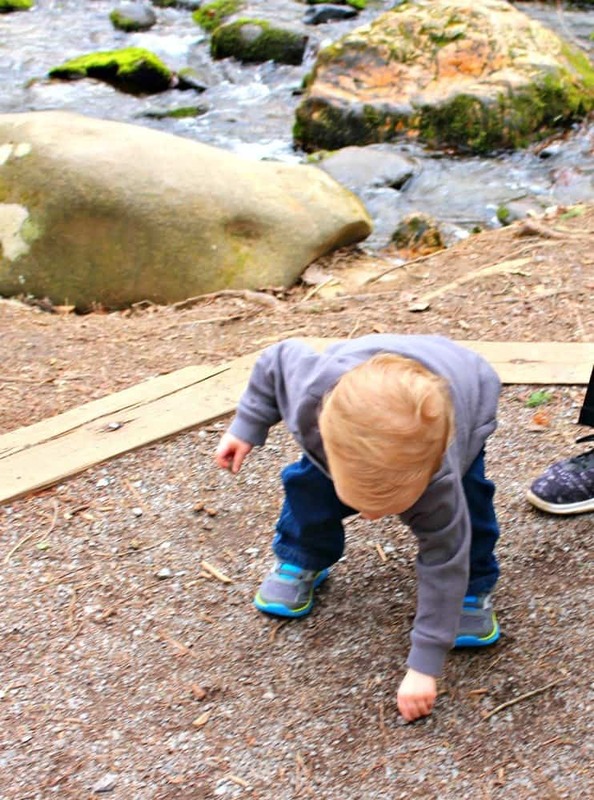 But, we were able to let my 15 month old out of his carrier to walk to some of the wider, flatter sections of the trail. 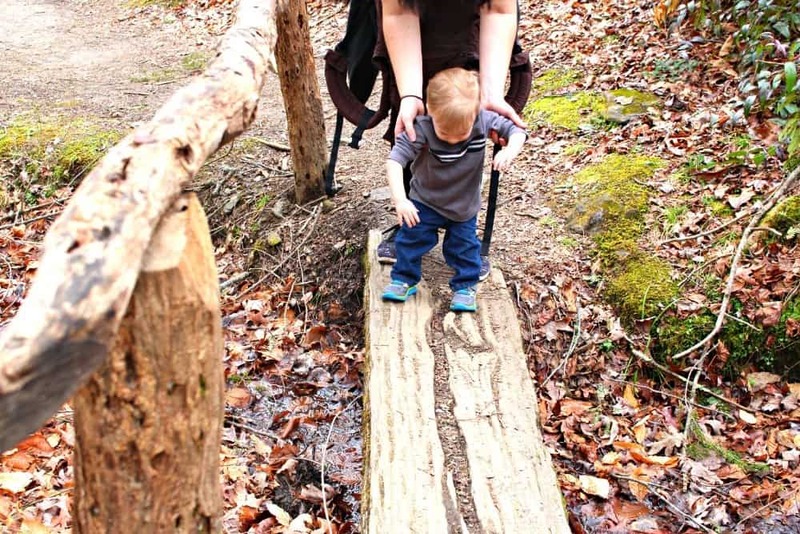 Another fun aspect of this kid-friendly hiking trail is the many unique bridges that you have to cross along the way. None of the bridges are very high, but for some reason, these bridges just seem to appeal to kids. Perhaps, they make it seem like more of an adventure! 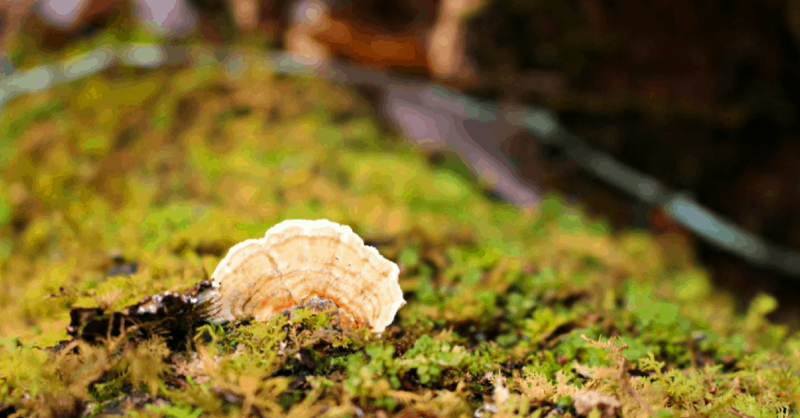 Although this is a shorter trail, there is still plenty of nature to enjoy. Even in winter, we were able to find plenty of beauty. 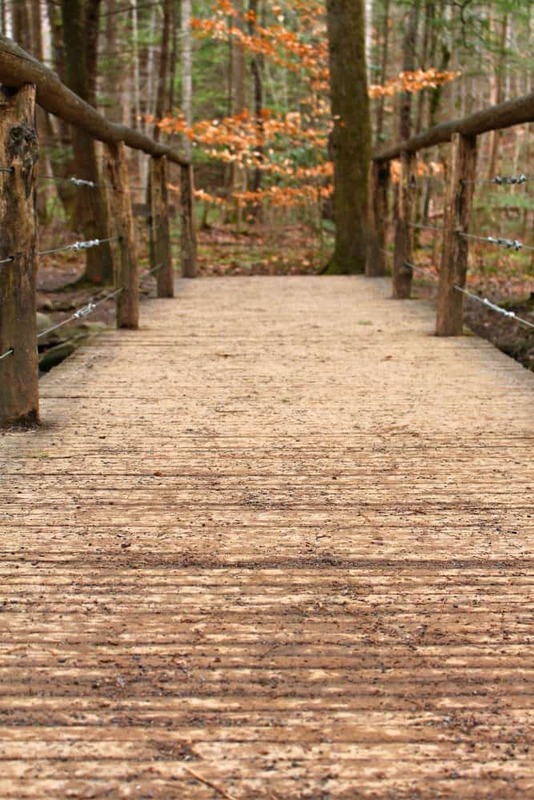 In the Smoky Mountains, there are actually plenty of great trails perfect for hiking in the winter. At the end of the loop, you can take an alternate path that will lead you to Cataract Falls. This is a very short gravel pathway that runs along a gorgeous stream. If you have an extra 15 minutes or so, I highly recommend taking this detour. I do want to warn you that the Cataract Falls are not quiet as stunning as one might expect from the name. This is a very small, but beautiful water feature. As always for your safety, be sure to bring your bear spray along for this hike. Wishing you all a wonderful day in the Smokies. Happy hiking!